The title is the media reaction, not mine. Yeah? 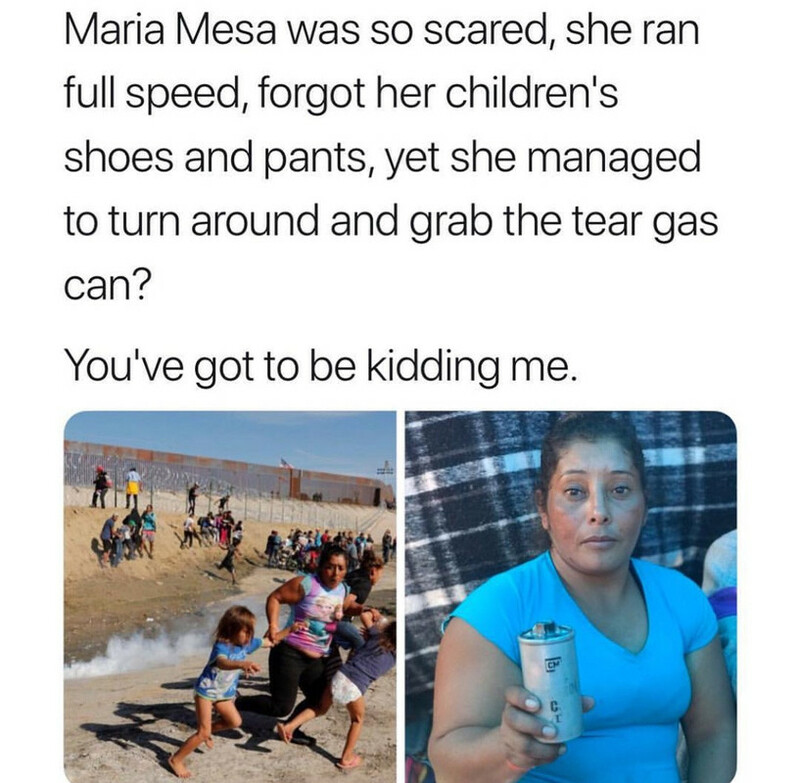 But Barry used good teargas, not that evil stuff Trump personally fired at all of those innocent womens and childrens. Build a wall to block illegals from forcing their way across and no teargas will be needed. Get the fake "refugees" to take the jobs they've been offered in Mexico and there won't be any need for them to invade the US, eliminating the need for teargas to keep them back. Which, by the way, destroys any chance they could ever have for asylum. On multiple counts. Genuine asylum seekers escaping violence are required to make their request at the first possible place that it can be granted (there are at least 6 places they passed in Mexico). And refusing to take the offer of work where it has been offered blows their claim to economic desperation. Not to mention that so many "walked" hundreds of miles and are still fat, many are carrying iPhones and other expensive gear, a whole lot of the food they've been given has simply been left laying on the streets and in doorways untouched, their clothes are clean and in many cases new and expensive, etc. So what? It was also policy to separate parents and kids under Obama. And those pictures of "cages" Trump's getting blamed for were all taken when King Barry was in charge of it. 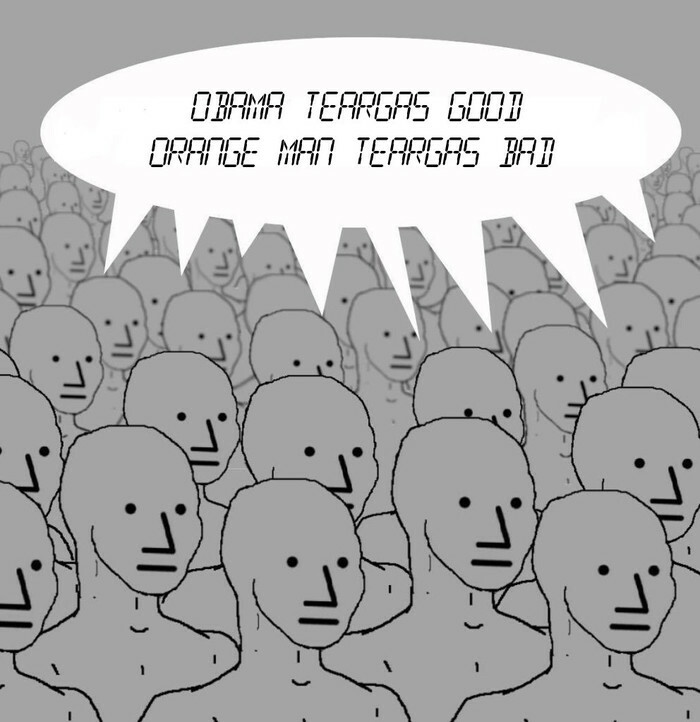 What does that have to do with "orange man bad"? I was gassed frequently for training when I was in the Air Force. Last time I looked, my heart was still beating. I think. When I was stationed in Texas, we went out almost every month to the field with the Army. We never got gassed directly. But the Army people did. And we were close enough sometimes that we got it, too. I just checked. I'm still breathing. When I was in Georgia the people who trained us used CS, both in a training chamber and lobbed at our tents while we were being trained in security. They also used to play tricks on each other, putting it on phone receivers and other equipment so people would be "gassed" when they used something. As hard as I try, I can't remember a single person dying or being hospitalized for any of that. We weren't even invaders. I think people crashing over your borders, violating your sovereignty and demanding you take care of them shouldn't be surprised if you fight back. Of course. Because after she was "sacred" the media stopped taking pictures and she ran back to grab the can to show off. I've seen a breakdown of the picture on the left. Some of the people in the background are media, some are invasion enablers. The teargas was real. THAT teargas maybe not. Most definitely this was posed and used to spread outrage among the people who are programmed to be.